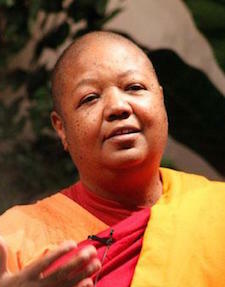 Bhikkhuni Dr. Pannavati, USA, Co-Abbot, spiritual director and founder of the Embracing Simplicity Hermitage and Abbess of Zuan Fa Temple is an American Buddhist monk, ordained in both the Theravada and Mahayana (Chan) lineages. She is a former Christian pastor, Taoist monk and initiated yogi, with a Master’s Degree in Education, a Master’s Degree in Business, and a Doctoral Degree in Religion. Bhikkhuni Pannavati is an advocate for women’s and children’s rights in the international society, as well as, equality and respect for females in the Buddhist monastic life, and the eradication of racial and socio-economic abuses in America. Both male and female monastics and Dhamma teachers reside at Embracing Simplicity Hermitage, which operates a homeless shelter for teenage males on the premises, a residential high school diploma and training program for disadvantaged youth ages 16-24, and a residential training program for teenage females with children. Through interfaith and community collaboration, the hermitage is also spearheading development in the city, building 16 houses for low-income families; and has received approval from the North Carolina Board of Governors to submit their curriculum to offer a Master’s Degree in Buddhist Psychology.